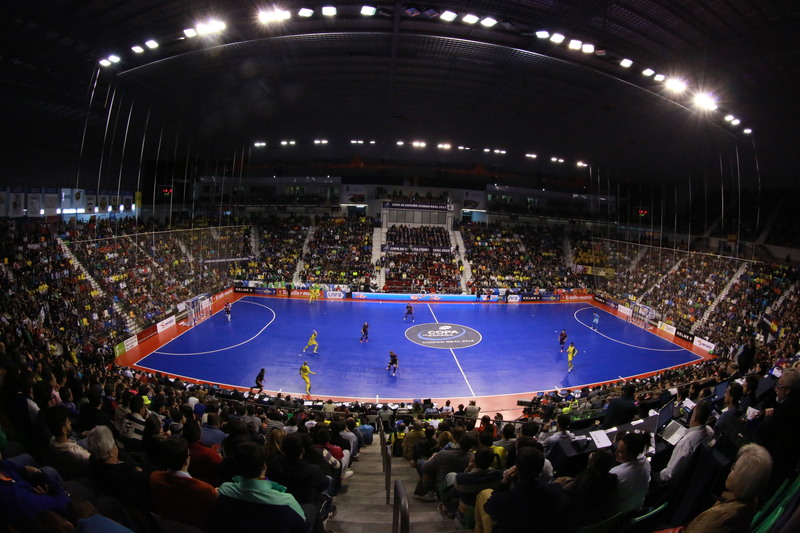 Futsal’s popularity is increasing rapidly in many regions alongside other indoor sports such as basketball and handball. The rising demand for court time has been so fast that it now far outstripping the supply in many places. In England this issue is substantial as there are very few sports halls due to the almost year round mild weather meaning, traditionally, most people played outdoor sports. The shortage of places to play has become the biggest constraint for futsal’s development and is preventing those that want to play the game from getting the opportunity. Despite there being many people and clubs interested in building and owning their own futsal venue, they often find this is not financially viable. The rising demand is increasing the potential revenues but the costs and risks involved are still stopping projects from going ahead. This balance between revenue and expenses needs to be altered favourably so there can be a surge in the number of new futsal facilities. During the Christmas break I was at The World Futsal Cup near Barcelona working and gaining experience as the tournament director. As part of the event there was a talk organised to present ideas on how a futsal venue could be built and owned at a much lower cost than conventionally is the case. These would be smaller facilities with multiple courts, more suited to increasing the opportunity to play and train rather than elite venues with seating capacity for thousands. Below I will summarise some of those ideas as well as including a few of my own opinions. As a side note I will be the tournament director at the World Futsal Championships in August in Florida, USA where there are both male/female categories from youth to open age. So if you are interested in participating go to USAFutsal.com and it would be great to see some of you there! The presentation was the idea of the first speaker, Rob Andrews, the president of USAFutsal. He founded this organisation in order to promote the sport he is so passionate about and wants to see develop. USAFutsal has big ambitions and through its various projects and initiatives has provided thousands with unique futsal experiences and even hosted the 2013 Intercontinental Futsal Cup in the USA. One of the latest projects Rob is involved in is the PFL, the upcoming American pro futsal league. The second speaker was a representative from Inov4Sports (inov4sports.com), a company based in Portugal, who have created some innovative products for the futsal market. 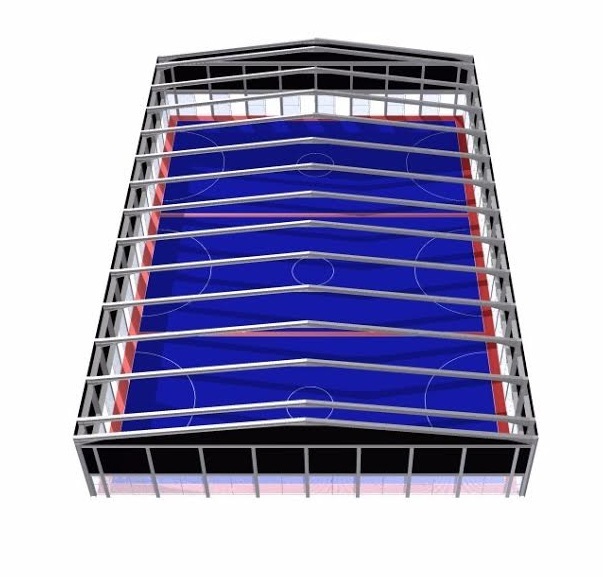 What structure could be used to house the futsal courts? Inov4Sports has created something called the MiCampo Portable Facility Concept. This is a construction that can be moved and open air but is fully covered to allow use 365 days a year in any environment. 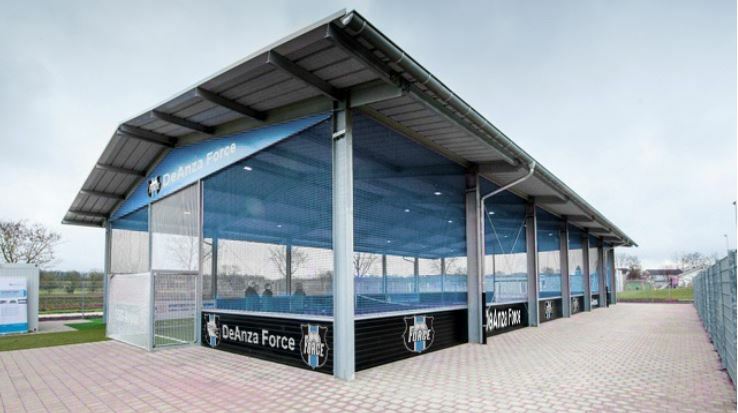 The product is fully customisable and can be built to your required dimensions with available options including heating/cooling systems, electronic perimeter curtains (could put club badge on outside or opportunity to sell the space to a sponsor) and extra covering to incorporate seating/changing rooms/café bar. The flexibility offered by a 100% portable structure has lots of key advantages including finding a location and financing, both of which I will mention later. The risks are much lower compared with using a normal building as if you find the initial location is no longer suitable or a better opportunity arises somewhere else, you have the option of moving. You could also change locations throughout the year, for example, if it was better to locate it somewhere different in the winter and in the summer. Where could the facility be located? Provide a specified amount of free use in return for not paying rent. Agree with local government to use some vacant or neglected land in return for an allocation of free hours for community use. In England this already happens with community organisations through something known as ‘Community Asset Transfers’. A rundown park facility like old tennis courts or brownfield sites would be perfect for this. A local politician would be happy to lend their support as they get acclaim for bringing a new facility to their community and there is no cost or management responsibilities to them. Plus its portability means they are not fixed into it forever but which politician is going to campaign to remove a cost free (both for the government and users) community facility? Similar to above, you could speak to a school or college to put it on their grounds. In return they get use of the facility during school hours. Both this idea and the above are suited to continuous reduction of state budgets, leaving little money for capital projects, especially for sport. Youth charities, sports organisations and religious groups such as churches who have land available and want to engage the local community could also be approached. Many companies hold onto land (known as “land banking”) to develop at a date long in the future and have received criticism for leaving this empty. In the UK the four biggest supermarket companies alone are holding on to over 4 million square meters of land that they have no foreseeable plans to use. An agreement could be reached for a lease at a very low rent and having the land being used will only help make it more valuable for the landowner. There is a trend that out of town supermarkets and retail parks are losing popularity and so it could be agreed to put a facility in a part of their underused car parks. They could see this as a way to attract more customers and revitalise the area. New development projects often need to provide a community benefit to obtain planning permission and an agreement for a long term lease could be agreed. The Spanish Futsal League, LNFS, approached Nuno Vicente from Inov4Sports to create a flooring system that was of the highest international standard, durable, portable and had a very fast installation. No product had been able to combine all of these features before as an improvement in one area led to another being compromised. It seemed an impossible task but through lots of creative thinking and testing prototypes they designed an incredible and unique product, unrivalled worldwide and now used by the LNFS. It uses plywood, the wood of choice for ship building, as it has resistance to the elements. The fixing system connections are located under the wood rather than part of it, as it is in rival products. 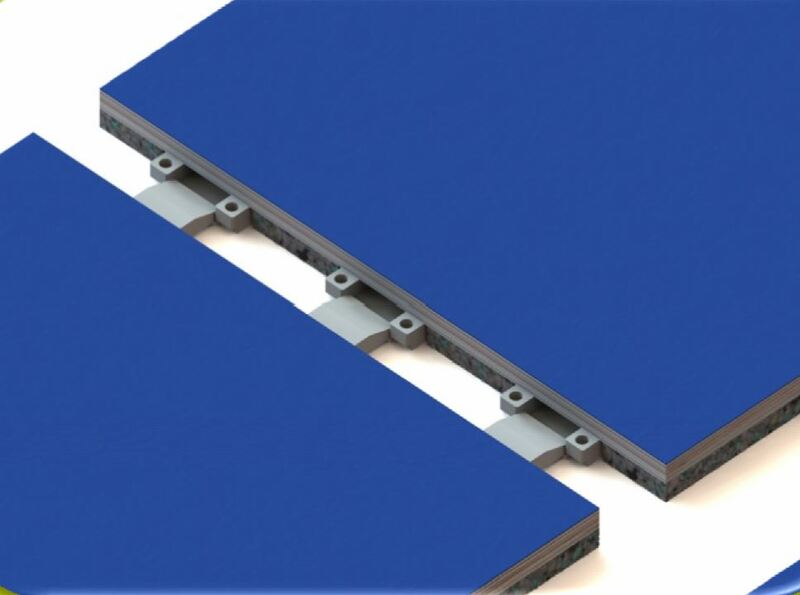 This prevents gaps appearing over time or damage during installation. Even if you do damage it, the fact it is a modular system means you only need to replace that one broken piece. It is also much easier and quicker to install than its competitors. If you have 6 people fitting it for example, it would take around 3/4 hours to complete a full size futsal court, double that number and you halve the time. By having a portable floor you can remove it to host events in your facility to generate additional income including other sporting or cultural performances, exhibitions and shows without risk of damaging it. Despite its superior characteristics it is around 20% cheaper than its competitors as the fixing system is much simpler to manufacture and they use the best quality plywood available, negating the need for a hardwood layer that has some problematic characteristics not ideal for sports flooring. How to finance the facility? Even if you get the land for free, the cost of the structure (much cheaper than a traditional sports hall) and the flooring still need to be paid for. This could be achieved through a bank loan with the interest paid with savings made by not having rent to pay. Instead of giving money to a landlord, you are paying for an asset that after several years you will own with no future rent (so no unforeseen rent hikes) or finance costs to cover. The fact that these facilities could be sold on to a buyer not restricted to a fixed location is a huge advantage for the bank in case of a default, increasing the likelihood of loan approval and lower interest rates (in a market where interest rates are at historic lows). It also lowers the risk for the purchaser as they can get out at any time. As the popularity of these facilities grow, a market will emerge and they will become easy to trade. Another option is to contact large companies who may be interested in helping fund the facility in order to receive equivalent tax relief. Additional benefits include creating goodwill in the local community and enhancing their brand. Depending on the country, there may also be access to grants. These facilities could be used to operate commercial futsal centres. The development of fut sal will be most successful if there is a financial incentive to encourage it. It is a sport very much suited to modern lifestyles where people have less free time and want something convenient. In England alone, 1.5 million adults play small sided football each week making it the most popular and fastest growing area of adult football (Could these numbers playing be replicated in terms of fans that follow the game?). At the moment they are mostly playing a different, and slightly strange, form of 5-a-side unique to England and most are unaware that a better version exists. Over the last 20 years there has been an explosion around the country of centres built to meet this demand for a 5-a-side version of football, proving the business model. If we could convert some of these people to futsal it would be a great way to get more people enjoying the globally most popular form of 5-a-side. The benefit of these movable facilities for a business is you could put them in several locations and see which ones perform well and relocate those that don’t. They also offer much more visibility than futsal courts located in warehouses. They could work very well under a franchise system. Another way they can be used to generate income is for promotional campaigns or at temporary events. Examples include a promotion at a newly opened shopping centre, throughout a major sporting event or during the opening periods of a theme park or festival. I hope you found the ideas here interesting. Even if you find these are not applicable to you, hopefully they at least get you thinking of different ways to achieve the goal of owning your own facility. Every country has its own circumstances and opportunities that can be taken advantage of. The more opportunities that are provided for people to try futsal, the more people will fall in love with this wonderful sport and it will continue to grow. On court futsal is a game of recognising and adapting to the environment/situation and finding a solution. If futsal is to fulfil its potential we need to mirror that off the pitch as well. Do you think these ideas could work where you are? Do you have some others you would like to share? Please feel free to leave your comments below. Huge thank you to Rob Andrews & Inov4Sports for sharing your ideas to help develop the game and allowing me to publish them to a wider audience. For more info go to USAFutsal.com or email nuno@inov4sports.com. Where can I find out more about the plywood flooring option Doug? Can you provide me with a website? Thanks in advance! Hi Justin. Go to sportssolutionsgroup.com to find out more about the flooring. Best regards. Where can we see one of these in person? Dough, which company can build this type of facility if I already have the land? I know where we can go for the flooring solution, but who offers the facility build out? I am Located in Ohio, USA. I have passed your contacts on to the relevant person. Thanks. Futsal in America like to see more basketball courts add futsal goals so kids have the option of playing either sport I believe it’s possible.What are your thoughts? I agree, the more opportunities to play the better though would only be suitable on a recreational level (and more for players under 10 or 4v4/3v3 pick up games for adults).